Aggressive surgery for the treatment of malignant pleural mesothelioma is being underutilized, costing patients significant survival time, according to a recent study. Researchers found mesothelioma patients from all three histological subtypes — epithelioid, biphasic and sarcomatoid — can benefit from surgery, despite a reluctance to perform it today. The National Comprehensive Cancer Network (NCCN), a nationwide alliance of leading cancer centers, encourages surgery only for epithelioid patients. This eliminates the option for almost 40 percent of those diagnosed with mesothelioma. This was the largest mesothelioma study comparing survival with aggressive surgery against no surgery for each histological subtype. Also measured was overall median survival by histology, regardless of surgery. Clinical Lung Cancer published the study. Simone, director of the Maryland Proton Treatment Center, was joined by researchers from Allegheny General Hospital in Pittsburgh and Penn Medicine in Philadelphia. The study involved 4,207 patients from the National Cancer Data Base who met specific criteria. There were 2,867 with epithelioid (the most common type), 773 with sarcomatoid and 567 with biphasic disease. Aggressive surgery — defined as either an extrapleural pneumonectomy (EPP) or a pleurectomy and decortication (P/D) — was associated with better survival times in all three subtypes when compared to no surgery. An estimated 20 percent of all patients diagnosed with pleural mesothelioma undergo aggressive surgery, also known as gross macroscopic resection. There has been a trend in recent years moving away from aggressive surgery for pleural mesothelioma, believing too often it reduces quality of life by causing more harm than good. There is no definitive cure for mesothelioma. Even after eliminating all visible tumor cells during surgery, almost inevitably the cancer returns aggressively. 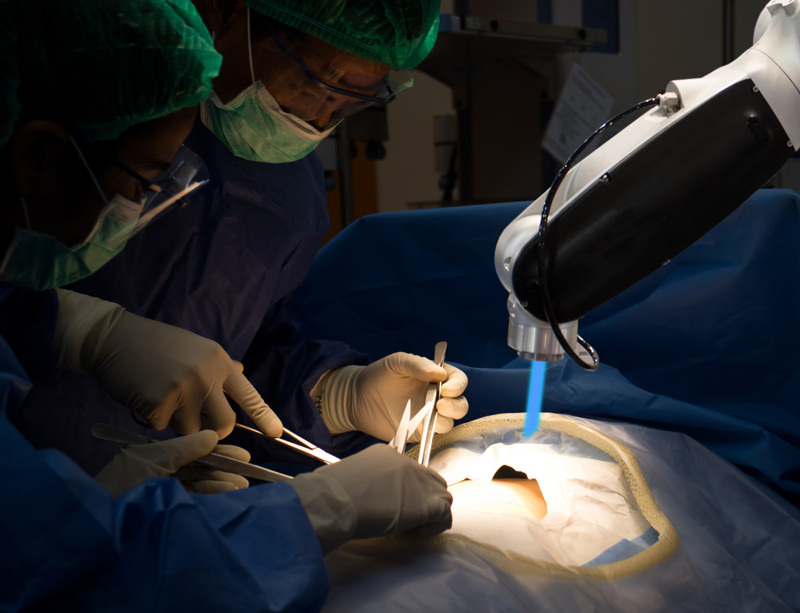 EPPs, which involve removing an entire lung along with major parts of the diaphragm, are not being performed as often as they were a decade ago. The NCCN changed its surgical recommendation for biphasic histology from 2016 to 2017, moving it from an operable to inoperable pathway. Surgery never has been recommended for sarcomatoid, the most aggressive cell type of mesothelioma. In its Mesothelioma Management Guidelines for 2018, the British Thoracic Society removed surgery from its treatment recommendations for all types of the disease. Regardless of histology, there are many factors that go into the surgery decision. Overall health, age, lymph node involvement, stage and extent of the cancer and performance status are among the many factors being used. The type of medical center also plays a role in the decision. A specialty center with vast experience in treating this rare cancer — and with a mesothelioma specialist — is more likely to recommend surgery. Many thoracic oncologists rarely see a mesothelioma patient and are unfamiliar with its intricacies. They often take a nihilistic attitude and a palliative approach, particularly with sarcomatoid histology. The majority of patients diagnosed with mesothelioma receive only systemic chemotherapy. Another study earlier this year by the same research team measured mesothelioma survival times for patients who went to high-volume centers against those at low-volume centers. The study found patients having aggressive surgery at high-volume centers — typically academic institutions — experienced fewer complications, shorter hospital stays, lower 30-day readmission rates and longer overall survival times.